Urolithiasis complicates one of 1500 pregnancies. Although there are metabolic and anatomic alterations during pregnancy that might predispose the pregnant patient to increased stone formation, urinary stones occur at similar rates in pregnant and non-pregnant patients (118). The modern approach to urolithiasis in pregnancy is initially conservative medical management (rest, hydration, analgesia, and antiemetics), as 70% to 80% of pregnant patents with symptomatic calculi will pass their stones. Patients with colic refractory to medical treatment, sepsis, obstruction of a solitary kidney, or social and psychological reasons may require a more aggressive approach (119,120). 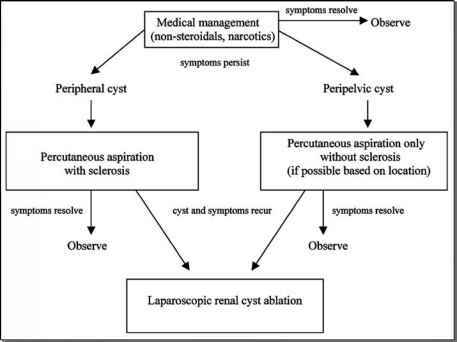 Invasive therapy usually involves either (1) cystoscopy and stent placement with or without stone manipulation, (2) ureteroscopy and stone manipulation, or (3) placement of a percutaneous nephrostomy tube (118). Open surgery, while rarely indicated, is a viable alternative in selected patients. Premature delivery rates have been reported in 6.5%, 8.6%, and 11.9% of patients during the first, second, and third trimester, respectively (120). Extracorporeal shock wave lithotripsy and percutanteous nephrolithotomy are contraindicated in pregnancy. Laparoscopic ureterolithotomy is considered a safe and reliable salvage intervention in nonpregnant patients using either a transperitoneal or retroperitoncoscopic approach (121,122). To date, there are no reports of laparoscopic ureterolithotomy during pregnancy.